An ex policeman lost his house, his car, his girlfriend. 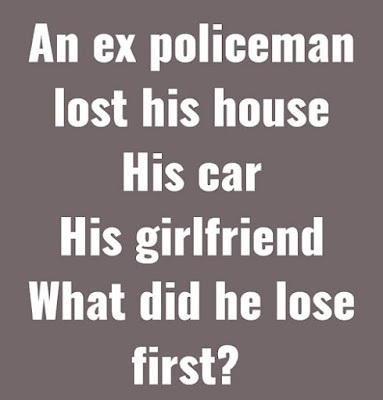 He lost his job first (Ex policeman). Since he lost his job, he might have lost his house, car and girlfriend. Correct answer. Don't let fools try to fool you in to their 'order of appearance = chronological order' argument. It's just plain wrong. If the policeman was fired then what should we call him? ?plz tell me. I totally disagree, there is nothing at all that suggest he lost his house first just because it was mentioned first. What if he started to mention the house first because it is what is most important to him than the car and the girlfriend? I am sorry logically he could have lost any of those first. On the other hand it would make more sense to me personally to say he lost his job first since that might result in no income and losing other things which requires money to maintain. I hear you say that he is retired but that is just an assumption just like you telling us he lost the house first. There is no where in the statement where they say he is retired so this just an assumption. I can also say he was fired from the police force and it will remain an assumption as well. SOMEONE PLEASE TELL ME HOW A RETIRED POLICE OFFICER LOSES HIS HOUSE. Since he was having a girlfriend, there are more chances that he was not at the age of retirement. But somehow lost his job. Simple, just because you retire doesn't mean you have a paid off house and enough money in the bank to continue making your mortgage payments. Maybe he got in to gambling debt with all his extra time now that he is retired. Maybe the house caught on fire and he was behind on his insurance payments. There are a million possibilities. Think bro.